Why Yacht Charter in Greece? As most of you know, I have traveled the world on cruise ships giving lectures to passengers on estate planning and asset protection dating back to 1990. There are two pieces of advice I always give my audiences: (1) Fly First Class or your kids will; and (2) Spend your kids’ inheritance: Many of you have taken this advice to heart! One of our most favorite destinations is the country of Greece. Not so much Athens (too busy and crowded for my tastes), but the coastal village and sea ports and the many islands in the Aegean are some of the most beautiful cruising in the world. During that time, Wendy and I have traveled to Greece more times than I can recall. The culture, history and warmth of the Greek people just cannot be equaled. The Greek food is just like none other. Visiting Greece by cruise ship which sails each night to the next port misses so much of the Greek experience, namely, dinning, sunsets, the entertainment and clubs. “Greece, the No 1 Yacht Charter Destination. It’s not only the emerald water and the idyllic unique bays: it’s not just the bright sun lights that floods the sea and the wonderful ravishing blue sky. It is also the breathtaking landscapes and white sanded beaches, the relaxed atmosphere, the culture and ancient history, windmills, ruins and old settlements. It is the Mediterranean cuisine at its best, from your private chef onboard. It is the absolute fin that comes hand in hand with the Yacht Charter experience in Greece. From clubbing all night, to adventure sports like scuba diving, water skiing, jet skiing, flyboard, mountain bike, or mountain hiking and many more. Most importantly it is the Greek crew’s professionalism and world known hospitality. It is all the above that makes Greece and the 1400 Greek islands, a world famous Yacht Charter destination. So, if you haven’t yet made plans for this summer, or are interested in visiting Greece in the near feature, we cannot recommend Cpt. Mike and his company highly enough. Mike and his team will help with all of your planning, boat selection, transportation from and back to the airport and everything in between. 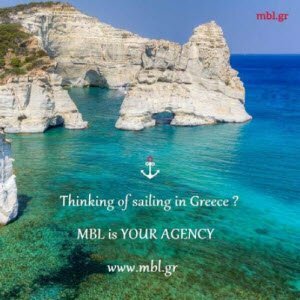 Contact Mike at: info@mbl.gr, and ask him to send you information on Greece and all it has to offer. I promise it will rate as one of the top travel experiences you and your family will ever experience.